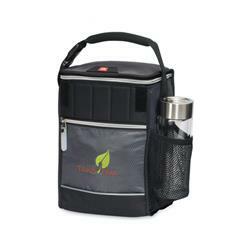 The Igloo Avalanche Cooler - a larger lunch custom cooler bag with your promotional logo. Pack a lunch to-go in style. Durable materials. Enhanced insulation and leak resistant, heat-sealed antimicrobial liner. Easy pull tab and Velcro top closure with expandable zippered option. Foam top grab handle for comfort. Side mesh water bottle pocket (water bottle not included). Front zippered pocket and ID window on back. 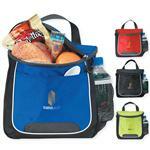 Detachment buckle easily secures lunch cooler to personal carrying bag. Stylish quilted accents and contrast piping. 8 can capacity. PVC free. Back panel of each bag matches primary bag color. CPSIA compliant! FREE 1-DAY RUSH PRODUCTION AVAILABLE! Other Igloo Promotional Coolers available! Available Colors: Black, Steel Blue, Citron Green. Production Times Available: FREE 1-DAY RUSH PRODUCTION AVAILABLE. Standard 5 to 7 business days with a paper proof. Available Imprint Options: Color Print or Embroidery. Additional color costs based on quantity order, please inquire. Full Color Imprint Available - Inquire. 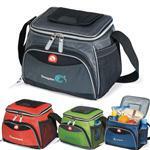 420D Diamond Weave, PVC Free, Igloo Brand Lunch Cooler, Avalanche.